Gloss Patrol is a regiment of six ultra-shine finish lip glosses with a slight plumping effect, that will prepare a pout for missions to the largest and most spectacular of urban hot-spots around the globe. Three strong pigments with a sheer varnish will march beauties to the metropolis base camps of Sao Paolo, Sydney and Paris. Three soft shades with a luminous, sparkling finish will take beauties to the thriving nightlife of Dallas, the neon lights of Tokyo and to Cairo - the jewel of the orient. 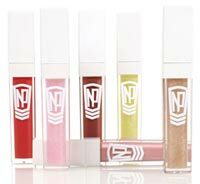 These Pout empowering lip colours were inspired by bright lights/big city chic. Contains high shine ingredients and plumping agents for full and fabulous lips!